What can Cal fans expect of the Bears in 2019? Max Mennemeier: While the Pac-12 may not feature the formidable depth of the SEC and ACC, the conference is top-heavy. Oregon State returns to 2019 aiming to defend last summer’s national championship, and despite losing some significant star power in the rotation and down the lineup, the Beavers are led by All-American hopefuls junior Adley Rutschman and sophomore pitcher Kevin Abel. UCLA, Stanford and Washington will also attempt to avenge postseason losses in 2018. The Huskies made a dramatic run to their first College World Series appearance in school history, saving face for the conference after the Bruins and Cardinal unexpectedly fell short in the first round. So where does Cal fit in the Pac-12 puzzle? Last year, the Bears had a productive season under head coach Mike Neu, but they only managed to make the laundry list of postseason snubs. Offensively, Cal can hang with any opponent in the league. The Bears finished in the top five of the Pac-12 in almost every major offensive category, propelled by Golden Spikes Award winner Andrew Vaughn’s impressive .402/.531/.819 line and 23 homers. It’s unlikely that Vaughn and others will slump in his third season, making the Bears likely to stuff the stat sheet again this year. Cal’s performance on the mound will likely make or break the 2019 season. After losing two-way star Tanner Dodson and ace Aaron Shortridge to the MLB draft, the remainder of the Bears’ pitching staff will have to pick up the slack. Who will step up given the losses of five strong players — Dodson, Shortridge, Jonah Davis, Tyrus Greene and Joey Matulovich — to the MLB draft at the end of the 2018 season? Lucy Schaefer: The losses of five players with some of the lowest ERAs and highest batting averages on the team will certainly impact the Bears at the outset of the season. Having recruited 13 freshmen to the squad, it is clear that Cal is looking to cultivate young talent both on the mound and at the plate. Until the Bears figure out where the younger pitchers are most valuable, they will rely on experienced pitchers such as juniors Jared Horn, Arman Sabouri and Rogelio Reyes and sophomore Carson Olson to bring a level of consistency to the lineup amid the experimentation. Furthermore, Cal will be looking to juniors Max Flower and Cameron Eden as well as sophomore Darren Baker to replace the holes in the batting order left by Davis, Dodson and Greene. And of course, the Bears will be hoping that junior Vaughn repeats an over-.400 batting average to keep the team offensively competitive in the tough Pac-12. Cal cannot simply rely, however, on a couple players to fill the shoes of the now-professional Bears; pushing the team from a middle-of-the-pack performance to top contention in the Pac-12 will require a combination of efforts from players in all positions, given the magnitude of the losses to the draft last year. How can fans expect the Bears to perform on the mound this season? Joey Patton: There’s a bit of uncertainty surrounding the Bears’ pitching staff coming into 2019. 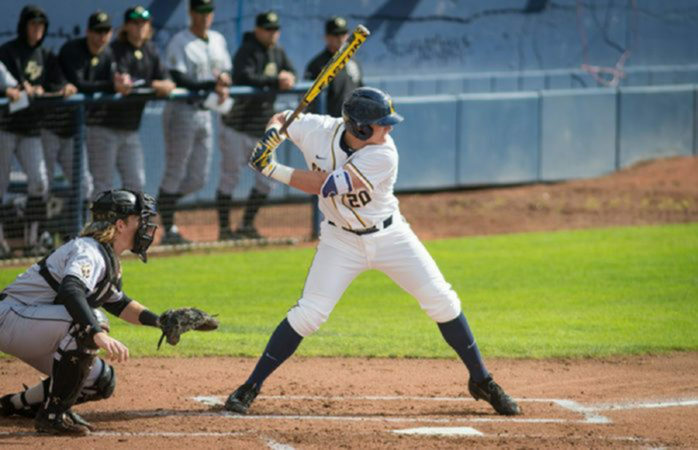 Between Shortridge, Matt Ladrech, Matulovich and Dodson, Cal lost nearly 255 innings to last year’s MLB draft, so the Bears are going to need some of their returning arms to step up and fill that void. As of right now, it looks like Horn and Reyes are going to be the top two pitchers in Cal’s rotation this season. Both suffered from sophomore slumps last year, as the former tossed a total of 71 innings for a 6.15 ERA, while the latter threw 28 innings for an 8.26 ERA. But despite these struggles, Coach Neu seems confident that the right-handers will find their form and lead the Bears on the mound in 2019. As far as relief pitching is concerned, Sabouri is going to be Cal’s go-to guy out of the bullpen. In his solid sophomore campaign, Sabouri threw an efficient 44 innings for a 3.07 ERA and a stellar 0.86 WHIP. Coach Neu hasn’t totally ruled out the possibility of Sabouri moving into the starting rotation, but he currently believes the lefty is most valuable as a “versatile bullpen guy” who can enter games in about the sixth or seventh inning. In addition to its returners, Cal is bringing in nine freshman pitchers this season, perhaps most notably Grant Holman from Chula Vista, California, who racked up an impressive 8-1 record in his senior year at Eastlake High School. It would be moot to try and predict whether these young aces will replicate their success at the next level, however, so all we can do for now is sit back and wait to see if they bring the heat in 2019. Contact Daily Cal Sports at sports@dailycal.org.